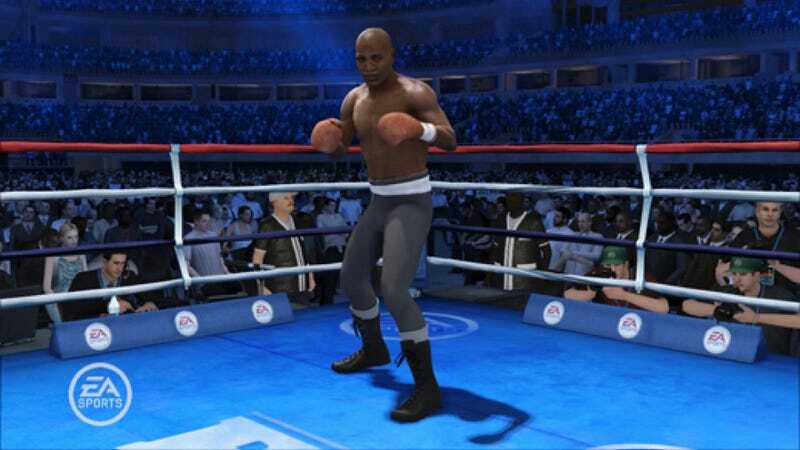 Fight Night Champion notably included bare-knuckle fighting during the prison chapters of its narrative mode, but the fighters in the main roster didn't participate in such bouts. Now some will. The game's first DLC extension, due out next Tuesday, adds bare-knuckle "Old School Rules" to online and offline play. Bare-knuckle boxing will play out like the prison sequences - no timed round, no referee, last man standing. So you can get in all the nutshots and headbutts you like. The DLC arrives March 29 for Xbox 360, March 30 on PS3. The DLC package will also deliver the five legendary boxers leaked out in a video earlier in the month: Jack Johnson [pictured above], Jack Dempsey, Joe Louis, Rocky Marciano and Floyd Patterson. Is This Fight Night Champion&apos;s First DLC Package? There are a number of pricing structures here. 800 Microsoft Points or $10 gets you everything. Individual boxers will be 160 Microsoft Points or $2. Want Old School Rules only? That's 340 Microsoft Points or $4. Also sold separately, for just a buck/80 Microsoft Points, you can get eight licensed fighters in alternate weight classes. They are: Featherweight Manny Pacquiao, Lightweight Manny Pacquiao, Lightweight Oscar De La Hoya, Middleweight Roy Jones Jr, Middleweight Bernard Hopkins, Welterweight Roberto Duran, Middleweight Thomas Hearns and Welterweight Pernell Whitaker.